During the summer of 2017, juniors Katy O'Neill (strategic communication and American studies) and Olivia Prosser (strategic communication and professional writing) participated in the Inside London and Inside New York workshops respectively to learn about potential career paths focused on the worlds of PR, media, journalism, and advertising. They were asked to provide personal insight in their experiences. 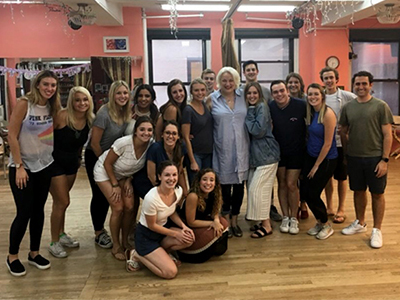 The Inside New York group had the opportunity to meet 'Come From Away' actress Astrid Van Wieren and hear about her life on Broadway. "I could never move to New York right after graduation," I distinctly remember telling my academic advisor last August. "It's way too daunting." Funny how quickly things can change. This summer, I had the privilege of traveling to New York with 17 other Miami students as a part of the Inside New York study-away workshop. This program is open to all majors, and it offers students an exclusive look into the fields of advertising, marketing, and public relations. Each day of the 3-week trip was packed to the brim with site visits to companies such as Forbes, MEC Global, NBC, and Madison Square Garden. "New York is the center for marketing and PR," said Bill Brewer, senior clinical professor of media & culture and strategic communication and coordinator of the workshop. "Companies have branches in Chicago and LA, but New York is, and always has been, the center for advertising and public relations." Another important aspect of Inside New York is exploring the city itself. Our first activity of the program was a scavenger hunt throughout New York. This immediately forced us to get comfortable with the subway system and took us all over Manhattan. By the end of the day, we were all pros. We also had the opportunity to see several Broadway plays, which, according to Brewer, "help students' cultural expansion." At each site visit we heard from speakers, most of whom were Miami alumni. "My favorite part of Inside New York, other than meeting other students with my major and similar interest, was making connections with Miami alumni and hearing their advice on how they became so successful," recalled junior strategic communication and psychology double major Kiley Harris. Seeing the incredible positions these Miami alumni hold made the daunting task of obtaining a job in the media and PR field become a reality. During the final week of the program, our group had the opportunity to complete a job shadow and see the inner workings of a PR or marketing position. The job shadow allowed students to spend one-on-one time with a professional in the field and gain valuable insight into their day-to-day tasks. I shadowed the marketing department at BARK, a provider of pet-themed products and technology. The BARK marketing team is lead by CMO and Miami alumnus Jay Livingston, and during my involvement I selected top grossing items for their online store and collaborated with Instagram influencers to promote BARK's newest line of toys. The hands-on experience I gained at BARK was a perfect end to the Inside New York trip, and being surrounded by lots of adorable dogs while at work was the cherry on top. For his job shadow, Daniel True-Omaits, a junior media & culture and theatre double major, worked with Miami alum and Animal Planet producer Keith Hoffman. "It was, in one word, incredible," he said. "I met with talent executives, sat in on conference calls with producers, and helped shoot footage for the Discovery Channel." Looking back on the past four Inside New York trips, Brewer added, "I hope students walked away with an understanding of the breadth and depth of the field." Students from this year's trip concurred that they learned just that. "Picking the brains of and connecting with alumni can truly change the direction of your life," True-Omaits said. "I was astounded at how willing Miami alumni were to connect and share their experiences and time with us. Hearing their stories helped me gain clarity on my own journey and future career in the industry." After three weeks in the city, a career in public relations became a reality, and New York became home. After hearing stories from Miami students of semesters abroad—both good and bad—I had decided that a semester program was not ideal for my objectives. However, I was seeking a way to apply my double majors of strategic communication and American studies in the real world after two years in Miami classrooms. While utilizing Miami's extensive study abroad and away resources, I stumbled upon the "Inside" workshops. Each one offers a niche focus for students with majors in the Department of Media, Journalism, and Film (MJF) and other departments based on their interests and studies — and it was Inside London that caught my eye. Miami's website describes Inside London as a workshop that "brings together students with interests and backgrounds in video production, journalism, public relations, and film studies to do advanced study of media in the United Kingdom as well as hands-on integrated marketing communication." The first two weeks of Inside London's 6-week summer program involve preparation to learn about media culture abroad. 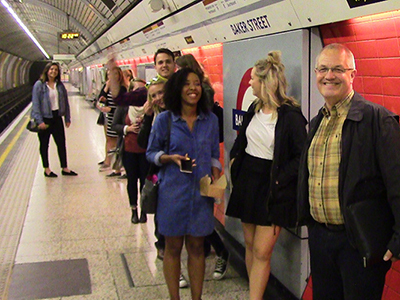 The middle two weeks take place in London with professors and students working in groups on an assigned PR campaign. The final two weeks are focused online, finalizing the PR campaigns from the U.S.
Drushel also teaches several media and culture classes. Prior to this summer, he has led the Inside London program once and a different London program three times. "I feel MJF students can benefit from first-hand exposure to the media systems in another country and culture," he said. "They should have the opportunity for a focused, affordable study-abroad experience. Inside London offers students the opportunity to work in teams on a project for a real-world client outside the U.S."
This summer, I and the 12 other student participants were asked to create a public relations campaign for Amazon International, which is headquartered in London. The campaigns are then considered by Amazon's creative team for future use. 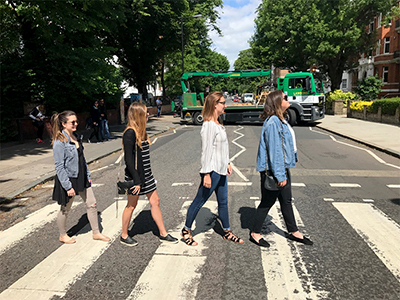 Inside London students (Claire Ebbing, Erin Robenalt, Katy O'Neill, Anna Redington) channel the Beatles' Abbey Road album cover. "It was really cool to work so close with such a globally influential company like Amazon," said Inside London student and strategic communication and interactive media studies major Claire Ebbing. "Also, to see and understand how and why they have such an incredible relationship with their customer base." The executive creative director at Amazon International, Steve Susi, is a 1993 Miami alumnus and one of Drushel's former students. Susi met with the Inside London group to discuss his path from Miami and career at Amazon, as well as help with the PR campaign. "With all of this history and experience, London stands alone as the one place where students from every nation on Earth come to learn the fundamentals of media, journalism, and film from the very people who invented them," said Susi. "I enjoyed meeting Steve because it was inspiring to see someone who was once in the same position as I am right now attain such an amazing career," Ebbing said. In addition to the project, field trips were scheduled to locations such as the BBC, the Museum of Packaging, Abbey Road Studios, and much more. "My favorite part was being able to freely explore my personal interests, along with structured teamwork that would help me as I plan to continue my education after graduation," said media and culture major and senior Rhonda Baldwin. "I loved that Inside London was diverse and explored different areas and concepts of media allowing us to broaden our horizons." As for myself, Inside London gave me an outlet to apply my knowledge in my field of study beyond the classroom and beyond America. I learned how to work in real-life situations and with a team, all while traveling in a foreign country and absorbing the culture. For more information about Miami's Inside New York, Inside London, and other programs, visit Miami Study Abroad and Away or contact your academic advisor.